The people of General Santos City have spoken and the winners of the May 13, 2013 elections has been proclaimed. People Champ Movement's Ronnel Rivera is the newly elected city mayor and incumbent vice-mayor Shirlyn Bañas also from PCM-UNA is re-elected after getting the most number of votes in the recently concluded May 2013 local elections. In the Sangguniang Panlungsod seven (7) candidates of PCM were proclaimed and five (5) from AIM. 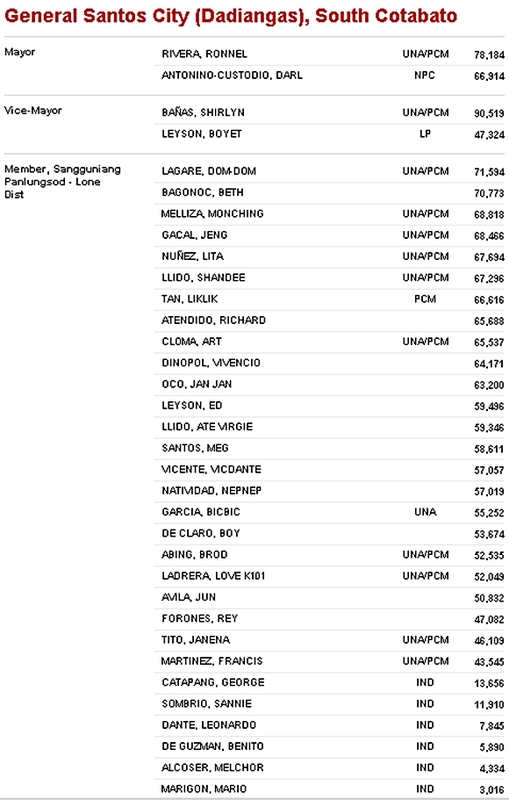 Below are the newly-proclaimed winners of the May 2013 local elections in General Santos City. Congratulations to all the winners! And as most of you promised during your campaigns -create measures to solve the energy crisis - ASAP!